Yesterday I spent about ten hours in front of a screen – eight in the office, one on my laptop at home and one watching television. More if you count the hypnotic hour of windscreen time I spent on the motorway. If this is the world we live in, why am I engaged in such an exhausting and long-running battle to keep my kids away from screens? It’s almost as if (weird music) I’m trying to replicate the conditions my own childhood. The difference is that back then there was no such thing as games consoles, mobile phones, DVDs, internet, ipads, children’s channels and the rest. How easy it must have been for parents to limit screen time when the only thing on offer was a two-channel television. In this house another Christmas has come and gone with Santa ignoring all the requests for screen devices that dominated my children’s lists. There is no television allowed during the school week and the children sometimes complain bitterly about the screen desert they are forced to live in. I’m starting to wonder if this puritanical approach will backfire one day. What if they spend the rest of their childhood seeking out contraband screen time? What if they become air traffic controllers? I’ve tut tutted with other likeminded parents about kids staring at ipads in restaurants or watching films on car journeys. The prospect of a generation of people growing up unable to entertain themselves or practice the art of conversation is not very appealing. But I wonder if my resistance to the norm is becoming a little self-righteous? Not to mention a little hypocritical, considering that blogging and writing involve a fair amount of screen time. So, while I will continue to worry about how much fruit and veg they are eating, whether they are dressed warmly enough and looking properly before they cross the road, I think the time has come to ease up a little on the screen restrictions. 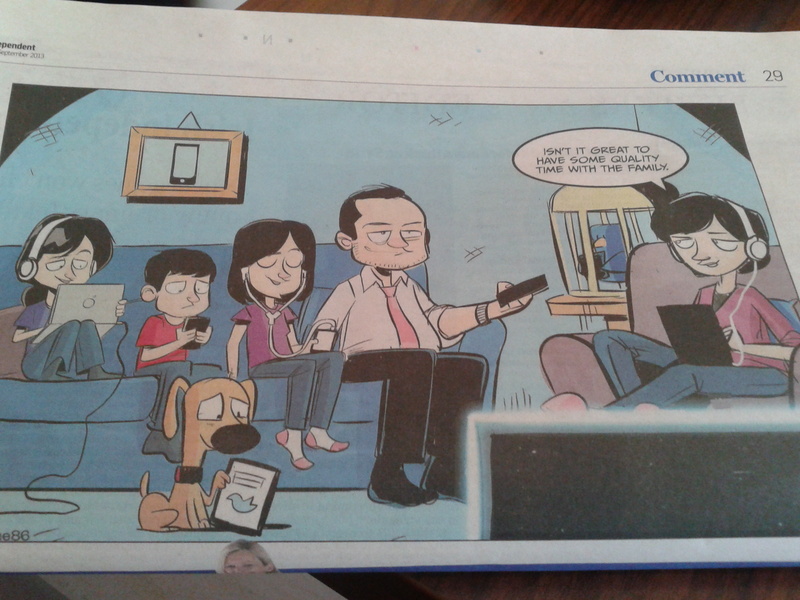 By the way, if you can’t read what’s in the speech bubble in the cartoon above, the mother is saying: ‘Isn’t it great to have some quality time with the family’. I came across this back in the Irish Independent last September and it now lives on our fridge. What do you think? Am I throwing in the towel too easily? Anyone else managing to keep the screens at bay? I’m probably not the best one to comment, Clare since my hubby and I agreed to give up telly when we got married 7 years ago. I also ration my kid’s screen time – she has a dvd about once, maximum twice a week, plus occasional ‘funny’ computer time with me (she’s with me now – not a bundle of laughs trolling the wordpress reader but she wanted to she her chicks on my blog so I pushed it). No probs at all with this arrangement but as friends have pointed out – just wait until she’s older and all her friends are talking about ‘whatever’. I’m not convinced. I think by then a pattern of habit will have set in. So no, I don’t think you’re being too hard at all. Loved the cartoon – nice one. Aha, so you live TV free! I really admire that. Actually I was without a television during my stay in Ireland and I didn’t miss it. Or anything I did miss I could have watched on the RTE player or equivalent – in theory. With the dongle that was impossible. Our new regime starts today. The kids can watch some television after their homework is done – if they remember to ask. Ha – that’s a good point – they do forget about it after a while … good luck with it. Typo ‘she’ should read ‘see’ – no I haven’t been drinking! I sympathize with today’s parents. There are so many “screens” available and so many individual choices to be made and enforced. When my children were small, they watched Sesame Street and Mr. Rogers’ Neighborhood. That’s all there was. Then we moved to the Philippines, and the choices were even fewer. My teenage grandchildren didn’t have cable TV growing up, but my daughter had to limit my grandson’s access to computer games to weekends. Between their childhood and that of my 5-yr.-old grandson, times have changed again. One of his kindergarten assignments this year was to practice using the mouse. I guess you can just aim for a balanced life for your children: studying, talking to people, exercise, and interacting with the screens they enjoy and you approve of. Good advice Nicki. We can’t ignore the fact that screens are part of our lives so we need to think in terms of balance. I’m no expert on screens and kids but I do think one difficulty is they have so much to play with there is little opportunity to be bored. Yes, I’m saying boredom is a good thing as it pushes them to come up with creative solutions for themselves. All I can say is that when my daughter was younger she always felt bad for the kids who couldn’t keep up with everyone else because they weren’t allowed to have the same things the other kids had so they never fit in and they were left out/behind. They were left out, ignored and invisible. My daughter tried to be friends with some of them but it didn’t work because they were so different. I’m not telling you to change your lifestyle but my grandchildren have done everything, just because my daughter never forgot how awful it was for the kids who were left behind. She still, to this day, talks about them and shakes her head. She felt so bad for them. They didn’t have the up to date things (clothes/toys/books) that everyone else had so they never fit in with life as it was at the time…they couldn’t keep up. We can’t really hold on to the past and the way kids used to be raised because that is gone. It’s only a matter of whether your kids are like all the other kids at an age when that’s important to them. I think it’s important not to feel weird because you don’t fit in. Kids play games together at night, each in their own home…that’s what’s happening now and if your kids are left out…they are really left out. It’s all a matter of what you decide to do, of course, but the divide between them and the other kids will continue to grow. I know it’s all stupid and not a good or sensible way to raise children but it IS the way they are being raised and either you want your kids to be part of that or you want them to be by themselves. Your call. And keep in mind that what’s important to us, as parents, is not important to kids who want to be like their peers. The things we sometimes think we are doing for their benefit can ruin their school years. I knew girls who were not allowed to wear make up and they just put it on when they were on the bus and took it off before they got home. Kids will find a way to get what they want and if they want to fit in they will do what it takes. If you don’t want your kids to lie to you, because they feel they have no choice but to do so, then you have to be open and honest with them and try to understand how your rules are affecting their lives. Because life is changing rapidly and if you are using skills from the past, then that’s where your kids will end up. And, seriously, it’s not that your caving…it’s all about what your children need to do in order to be part of what’s going on today. THIS is happening and we can’t stop it. So you can join in and learn about it or be left behind. Life is tough and so are the choices parents have to make but you can’t protect your kids from things…they will do what they want , no matter how much you love them or want the best for them because PEER PRESSURE rules their lives and no one wants to be a loser. So if they have to choose between you and their friends….right. I know who I would pick and I’m a grandmother to teenagers. This is just my opinion. I don’t know where you live. Maybe that makes a difference. I’m from Chicago and now the suburbs but I also taught in high school for awhile and at the University (I’m not actually a teacher but I taught anyway). I know what’s important to kids and I know what they will do to be part of the group. Just saying’. Ah, you live in Switzerland…that may make that huge “common” null and void. I don’t know anything about kids in your country. Forgive me for not catching that sooner. I just know how it is here. Good luck, my friend. Thank you for your comment Hitandrun, you obviously have lots of experience and I do think the basic message of what you are saying applies across countries and generations. There is a balance to be struck between the values you want to instill in your children and the norms they will absorb from the rest of society. Obviously we want our children to be equipped to deal with the real world but I still think there have to be some limits on screen time to ensure it doesn’t take over.